Six drivers known for their tendency to speed were invited by families and friends to their own mock funeral on March 29, giving them time to reflect and comprehend the horrific aftermath that everyone has to endure after a road accident/ death on the road. 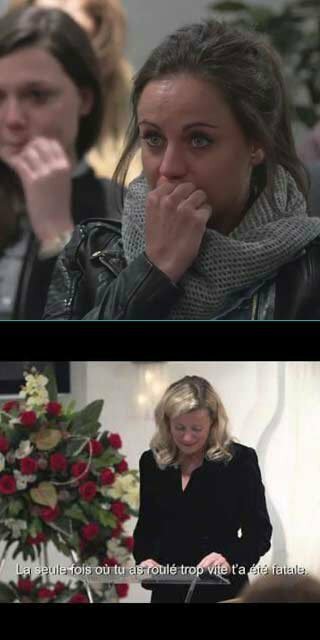 The emotional service was all recorded on secret cameras deployed by The Belgian Road Safety Institute (BIVV/IBSR) in connection with their integrated road safety advertising campaign. The footage captured resulted in the production of a YouTube video, “What if you were invited to your own funeral?” and has had over 2.5 million views since its launch on April 7. The institutes ‘Go For Zero’ campaign includes sites in French, ilestpartitropvite.be, and Dutch, hijistesnelgegaan.be, from which viewers can send messages to their speeding friends. She had barely started living her life on this earth. Death may be difficult to accept but it’s part of life after all. Let’s take a moment to reflect on this. Some close friends and family will now say a word. “I thought this only happened to others. But now here I am. Why did you have to go? Why you? The person I did everything with? With whom I could share everything? I met you almost 20 years ago. You are the brother I never had. I remember those Sunday mornings. We used to play catch on Mum and Dad’s bed. We still had a list of things to do. In April we were going to Brazil together. It was the night of October 21. The telephone rang. But it wasn’t you. It was the police. Speeding, just this one time, marked the end of you. I cannot and do not want to try and understand. It feels so stupid. You in a coffin. And me even more so standing up here talking to you. My darling child. I want to be strong. But how is that possible. I am a father who is burying his daughter. It is terrible seeing you plucked from our lives like that. You were my friend, my support and my hope. You fooled around again on the road and it was one time too many. Kim, this time I can still ask you. Please be careful when you are driving. I don’t want to lose you. Please never speed again. We love you too much to lose you. Please listen to me. Slow down.” Convince your friends to slow down before it’s too late. 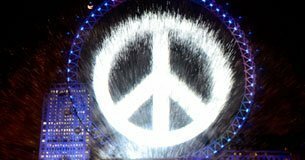 The Lynx Make Love Not War campaign saw London’s iconic Tower Bridge adorned with a giant peace sign, while further down the river a huge water projection in front of The London Eye created a beacon of peace. Paddy Power hit the headlines with another controversial PR stunt. What Does Virtual Reality Feel Like? 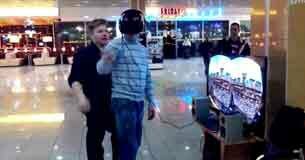 A consumer decides to take part in virtual reality. 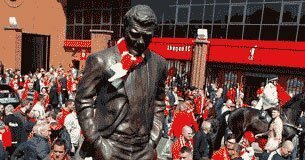 He soon shows spectators how real the experience can feel.